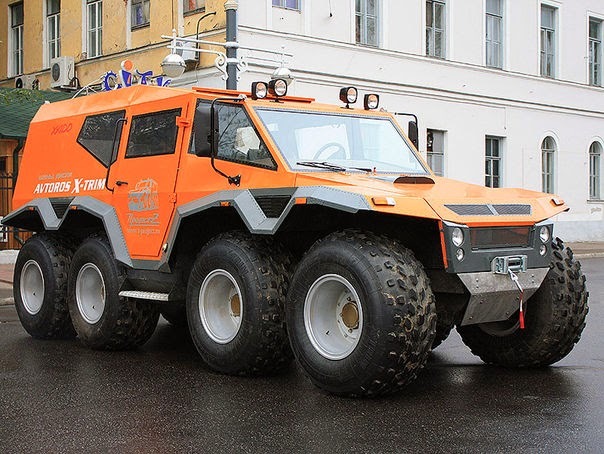 The Avtoros Shaman is considered one of the best off-road SUVs' in the world, with tires and rims manufactured in Russia, and has set itself apart. 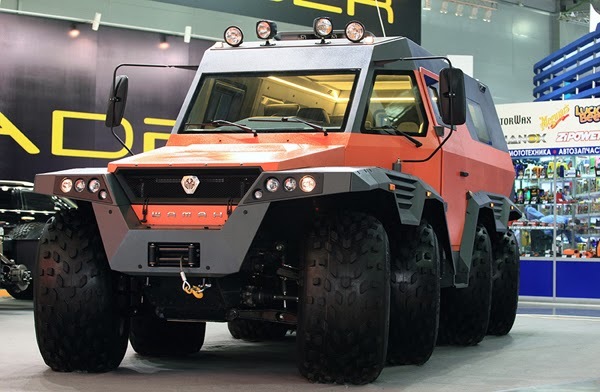 A monster of a vehicle designed for the Russian tundra with dimensions of 6.30 meters long, 2.50 meters wide and 2.70 meters high, sure to be a welcome diversion for any off-road fans. 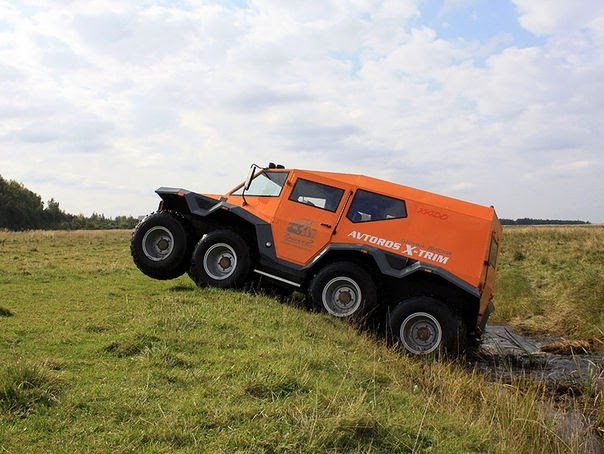 First presented at the Moscow Auto Salon 2012 - The Avtoros 8x8 Shaman is classified as an eight-wheel all-terrain vehicle. 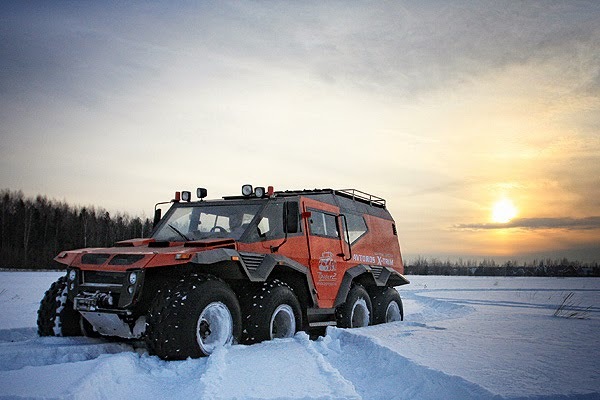 It climbs over the toughest terrain, glides over frozen earth and tundra, and it is also amphibious. 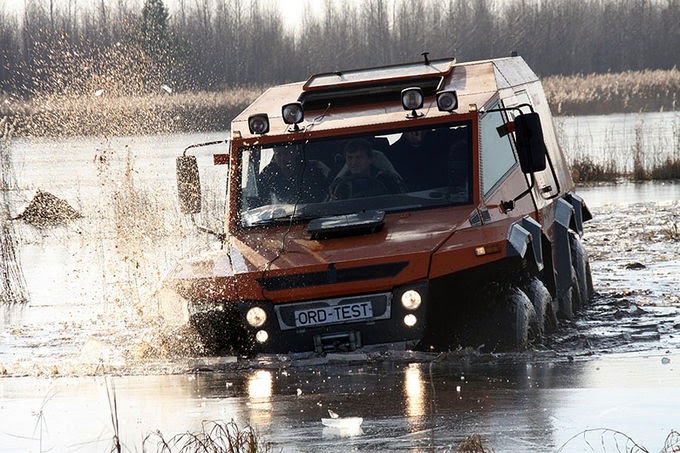 It navigates 7 km/h in the water and you can also attach an outboard motor. All wheels are powered simultaneously (hence the distinction 8x8), but even more amazing, each axle has independent steering which creates some interesting maneuverability. It easily dominates the Crawling walk like a crab to the right or left. 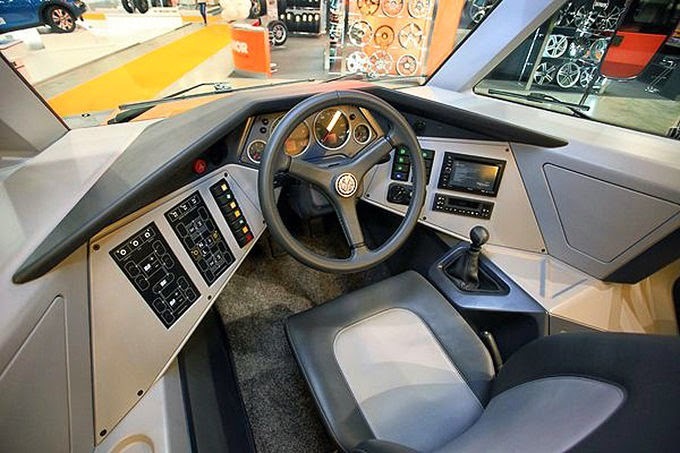 The cockpit design is a combination of early James Bond and Star Trek. Space does have eight friends. 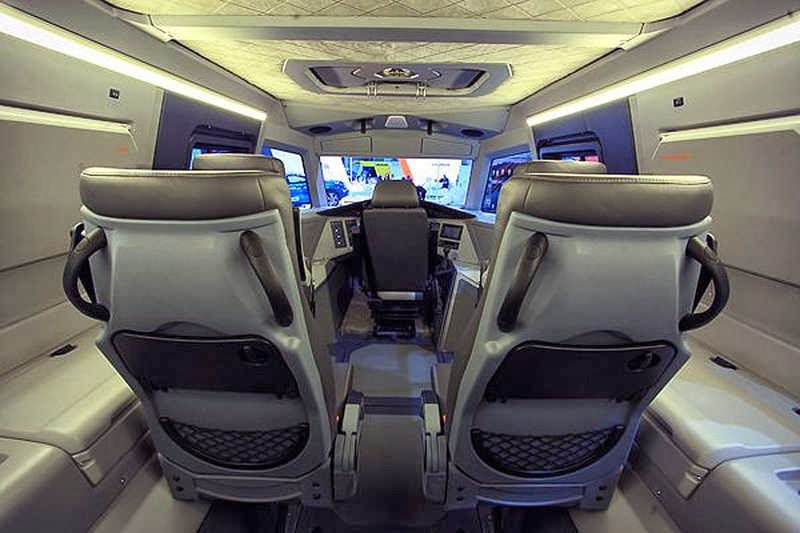 The three-liter engine is an Iveco turbo diesel which delivers 176 horsepower and it can reach speeds of up to 70 km/h. 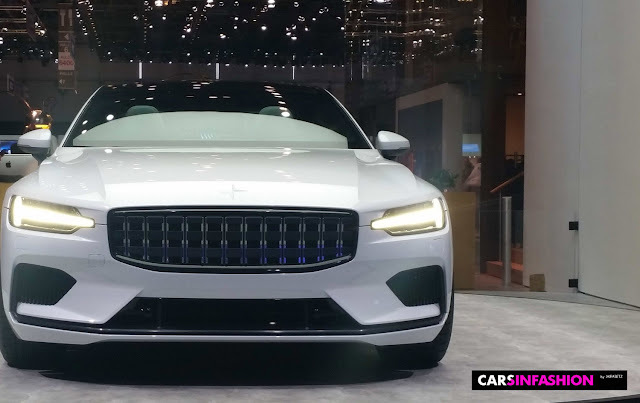 Thanks to the construction of the special 21 inch tires (1.2 meters high and more than half a meter wide) which can be lowered to prevent it from sinking into marshy ground. 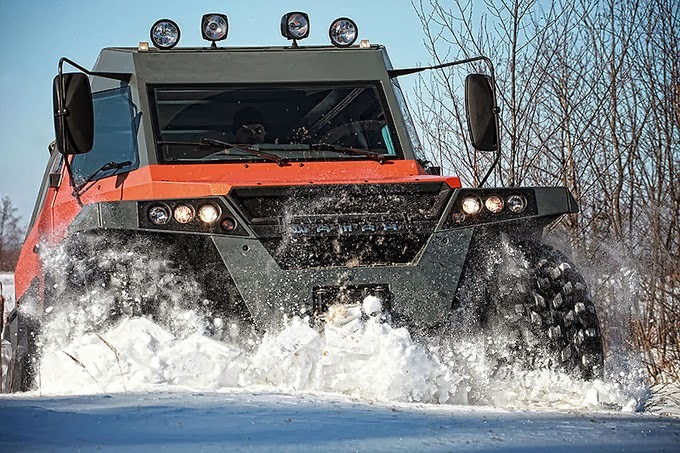 Considerably faster and more economical than other road heavy-weight tracked vehicles, the Avtoros Shaman is priced around 170.000 Euros and the orders are coming in rapidly.